Sometimes all you need is a man and his acoustic guitar. 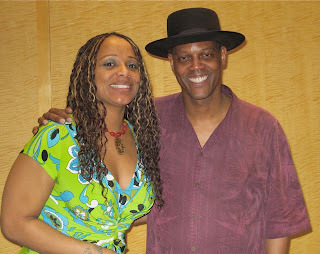 It was enough, it was ample and beneficent, when blues singer/songwriter Eric Bibb came to the Dakota for one night before a sold-out crowd at an open curtain show. He seemed a bit hesitant at first--he had to start one song over a few times because he kept skipping a verse--but we were with him and he knew it and it was magical. Godson of Paul Robeson, nephew of John Lewis (of the Modern Jazz Quartet), son of folk singer Leon Bibb, Eric has an impeccable pedigree and a quietly powerful stage presence; you can't take your eyes off him. His voice is rich and husky; hear for yourself, and remember as you listen to these songs from his new CD, Get On Board, that at the Dakota there were no backup singers, no other instruments, no studio arrangements. Just a man and his acoustic guitar. He's on tour with his new CD but sings and plays songs from earlier albums; he's been recording since 1980 and has made several. We hear "The Cape," a song by Guy Clark with wonderful lyrics: "He did not know he could not fly, so he did.... Spread your arms and hold your breath and always trust your cape." And "Stagolee," aka "Staggerlee," which Peter Lang called "Stackolee" when he played it at the Dakota six days ago. We hear "River Blues" and "Connected." Telarc, Bibb's label, has posted a video on YouTube of Bibb singing this song. "Still Livin' On" is about Bibb's heroes: Mississippi John Hurt, Elizabeth Cotton. "Water" was inspired by Spike Lee's documentary film about Hurricane Katrina, When the Levees Broke. "Diamond Days" is "a song from my life as a troubador," and it's also a theme of the evening; Bibb says more than once that "this has been a diamond day." He explains that "Kokomo" came to him in a personal crisis, and that "a truly inspired song is a mysterious entity...a blessing, a gift." "For You" is a love song: "Give me the pieces of your heart when it's broken/I'll mend it for you." "Shingle by Shingle" is about "putting your life together when you've trashed it." He's telling stories, singing songs (both originals and blues standards), holding us all in the palm of his hand. There's no club chit-chat tonight. This is church. It seems like many of his songs are love songs, tender and sweet. He's singing the blues, but not the poor-me, I'm-a-loser blues. Bibb's blues are illuminated with rays of light: hope, belief in love, spirituality, sincerity. The final two songs of his last set are "I Heard the Angels Sing" and "Love Train:" "Make sure you're waiting at the station with your heart open wide." After all this, he gives us an encore: "In My Father's House." We don't want to let him go. The Dakota has long been mostly a jazz club, and it's booking more blues lately, and there's talk among the regulars about whether that's a good idea or not. Some of the blues I don't care to see (some of the jazz, too, for that matter), but tonight I feel lucky to have heard this man and this guitar in such an intimate setting. Bring him back, please. 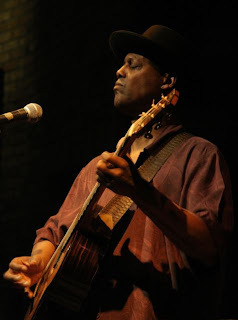 Top photo of Eric Bibb by John Whiting. Bottom: Bibb and the Dakota's lovely Deborah after the show.